Lots and lots of little areas and details. That’s what makes this canvas so fun. Even though the areas are small we can still fit stitches in them. Today was lesson two of Lulu’s La Sirena Mystery Class. 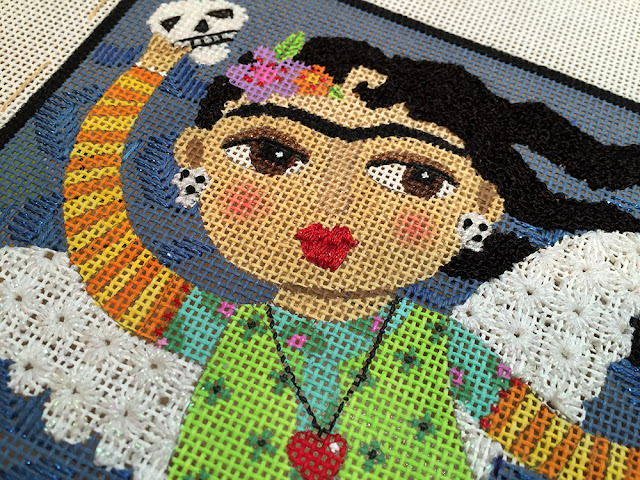 She’s oodles of fun to stitch. Her tail is a new Scallop Stitch stitched in the prettiest pink over dyed silk and accented with sequins and metallic. Her wings are a beautiful lacy eyelet stitch, quick to do with big impact. We will finish her in three weeks! Just one more lesson. 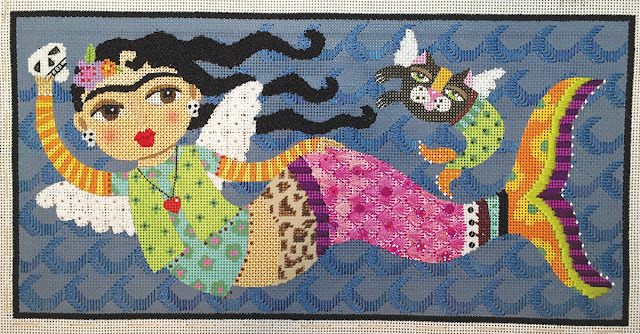 More canvases will be arriving so if you would like to stitch your own mermaid, give us a call at 410.296.0405 or order her online here. I wasn't going to peek at this so I would have a surprise later in the week but (as you can see) I couldn't resist. I LOVE LOVE LOVE the direction this is going in. 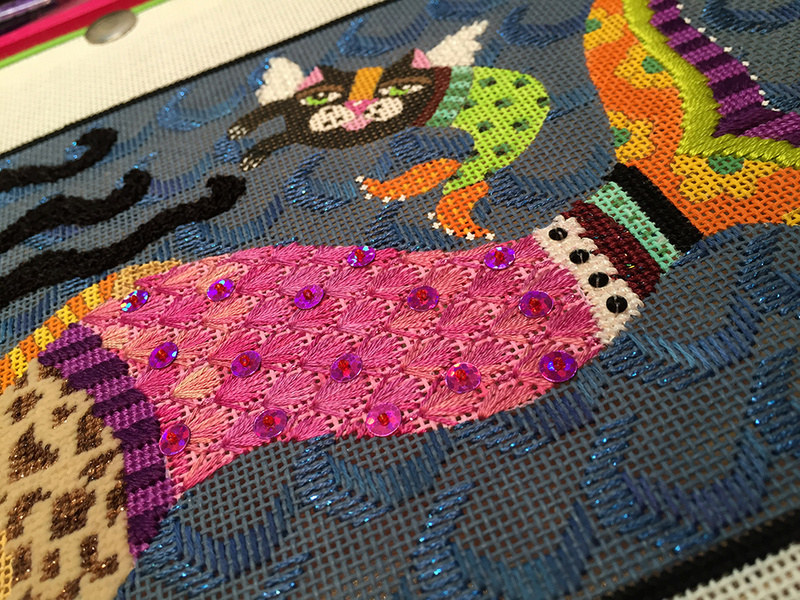 That scalloped tail with SEQUINS! SQUEE! And the wings are just perfect – I was wondering how you were going to handle them. Boy, lesson three is going to be a doozy – still lots left to play with! (and the cat!!! CAT!) Can't wait to see it with all of your fabulous touches! In the meantime, I'm finishing up a few more waves and ready for lesson two! Oh this is just fabulous, I love what you've done with her tail! Am so anxious to receive my canvas, etc…. She is wonderful – can't wait to see what you do with the cat! I agree with Christine- and im all caught up and so jazzed for lesson 3! This has been the perfect project for me and am looking forward to the halloween hooter!